Last time we talked about offline navigation in Locus – what to download and where, what source of routing data to select, how to set it all. Let’s leave the data sources behind for now and focus more on settings of Locus navigation process itself. We’ll mention options of influencing the routing, automatic route recalculation and other interesting stuff. Seemingly, both mean the same. In both cases Locus navigates to some target. In the first case, however, it’s the routing engine that takes care of creating the route based on our requirements and available routing data. In the second case, we provide the route. Either by drawing and saving it directly in Locus or in some other app or web service and importing it. Anyway, let’s have a closer look at the first method. Let’s navigate to a point! Navigation to a point can be launched by the Navigate to feature that can be found in Menu > More functions. 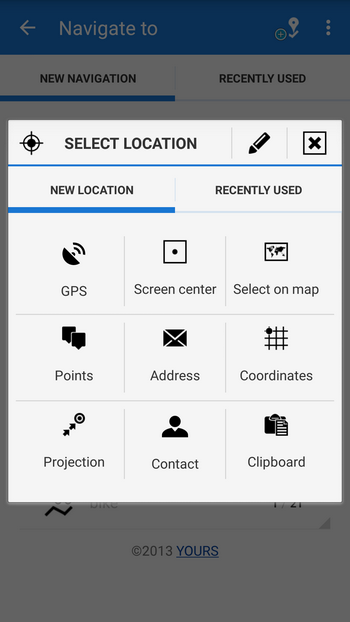 At start, Locus offers a selection of the point location methods – GPS coordinates, map screen center, the map, address etc. Other two transit points can be added by the same methods. 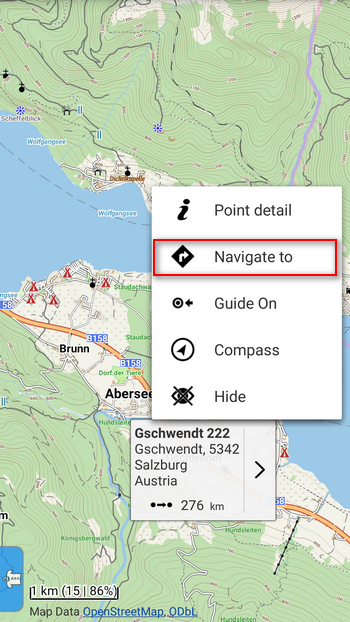 Navigation to a point can be started also from the context menu of a particular point – the destination is already known. Now select the means of transport by which to get to the point. The offer may vary depending on selected routing service – e.g. OSRM offers a car only, YOURS two cars, two bikes and walking, the same offline BRouter that can be further modified. When you tap the means of transport, the route is generated and the navigation started. Then first of all, find the route you want to go along – either in the track tab of Data manager or on the map, if the route is active and visible. 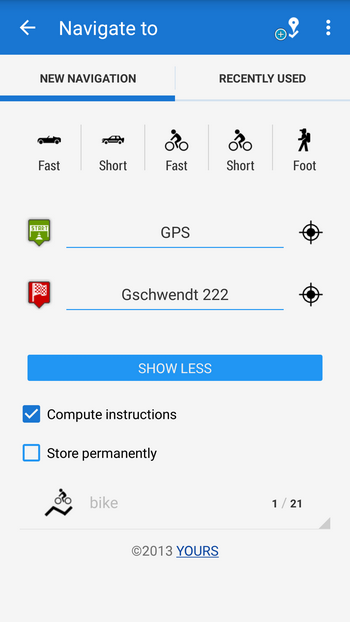 The route detail dialog bottom bar contains the navigation button – tap it, select navigation and Locus processes the route (generates voice commands etc.). The navigation is started, no further setting (means of transport, data source) is required. The route is given in advance. What if I deviate from the route? point priority – if you leave the original route Locus generates another one leading to the nearest transit point. If you didn’t define any it generates a new route directly to the final point. What you want is to get there, and you want it quick or along the shortest possible way. route priority – in this case Locus does its best to get you back to the original route so that you would miss as little of your trip as possible. You don’t hurry, you want to enjoy the ride. Automatic recalculation works the same for both navigation method. Just keep in mind you need Internet connection if you use some online source of navigation data. I wouldn’t like to lose a single meter of my ride, what then? In case you for some reason really need to go strictly along the planned route, Locus offers a special feature called Strict route navigation. You’ll find it in Advanced section of navigation settings. What is its principle? Each route consists of a chain of “invisible” routepoints. When you leave the route and have this feature on, Locus tries to get you back on the last omitted routepoint. And it can be quite persistent so make up your mind thoroughly if you really want to switch this feature on. And one more thing – in case of recalculation with point priority the strict route navigation, logically, doesn’t work. Analogically to other Locus features, also navigation can be further customized. You can select another voice for commands, add voices, define the amount of automatically generated navigation commands, set route deviation notification and much more. All is described and explained in our user guide. bohužel jako hlas pro navigaci mám je Android TTS. Je nějaká možnost dostat do aplikace kvalitnější hlasy? Is there an option to define some points (areas) you do not want to go through? I think Broute has nogo points. It would be useful in cases there is a way on the map that is not present in reality or is not suitable for e.g. driving. Yet it would be nice to use the standard navigation and still have the option to permanently exclude some roads. Obviously, it would mean deeper BRouter implementation in Locus or some other solution. Then I would recommend to insert the topic to our help.locusmap.eu and start collecting votes from other users.